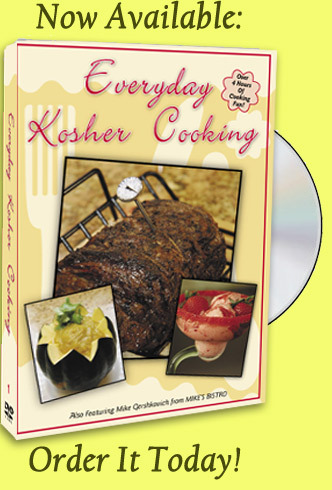 Everyday Kosher Cooking DVD:: Learn Kosher cooking from NY's top chefs! Experience Kosher Cooking Like Never Before! In the world's first Kosher cooking DVD series, Everyday Kosher Cooking brings together a lineup of New York's Kosher chefs and culinary experts to show you the secrets of preparing and serving everyone's favorite dishes. With OVER 4 1/2 hours of kosher cooking, there is something for everyone! Everyday Kosher Cooking DVD: Volume 1 is hot off the presses and now available in our online store! Click here to see what the hype is about! Perfect gift for yourself or anyone who loves (or hates) to cook! (C) 2007 Shtark Media and Siyata Corp. Website by Piliavin.